What gifts do you get your friends who have Crohn’s or Colitis? The holidays are coming up, and we’ve got some awesome ideas that will show them how much you love and support them! Here are 10 ideas that will go great with Ask Me shirts. Need more? Here are 12 more inspiring, healing, and funny ideas. 10. Lavender Scented Oil – Lavender triggers natural relaxation, and emu oil is a gentle moisturizer that helps heal scars. Olivu 426 handmakes products with all-natural ingredients, and you can add any scent into any product! Sandalwood is another great scent for relaxation. 9. 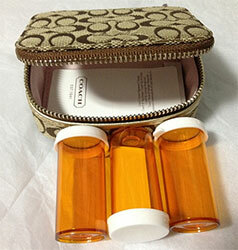 Designer Pill Box – What lovely lady doesn’t appreciate a high fashion case for storing her meds? These small pill cases that contain 3 small containers for medicine on the go, and can be found at more and more retailers, from stocking stuffer priced Charming Charlie’s, to high end Henri Bendel. 8. IBD Healing Plan Cookbook – This new cookbook offers IBD-specific recipes as well as understanding of how a proper diet can positively affect your symptoms. It also touches on the involvement of emotions on Crohn’s and Colitis. 7. Relaxation and Focus – Gift certificates to the local spa for facials, massage, or acupuncture treatment are great ways for patients (or anyone, for that matter!) to relax after a hectic holiday season. Gift certificates for yoga or tai-chi can get your loved one started in a class that provides not only relaxation, but lasting benefits. 6. Heated Nightlight Toilet Seat – Replace your existing cold, dark toilet seat with this heated one, complete with a soft nightlight. Midnight bouts of urgency are just that much worse when you plop down on a cold toilet. 5. Charmin To Go – For a great stocking stuffer, find small items and sample sizes that patients can carry in their purse, stash in their backpack, or keep in their car. Travel toilet paper rolls, small packs of flushable wipes, and keychain hand sanitizers make great small gifts! 4. Two Steps Forward, One Step Back Book – This memoir book follows Tucker, an active individual, as he deals with colitis, his active lifestyle, and adapting the specific carbohydrate diet (SCD). It’s written from a mother and son perspective, so it’s a great gift for parents of patients also. 3. Fun Toilet Paper Holders – There’s no such thing as too much extra toilet paper. Keep it on a fun holder in your bathroom. This Squidoo page has a variety of holders from cowboys to flamingoes, and even has a talking version! 2. Poo-Pourri Bathroom Spray – “Spritz the bowl before you go, and no one else will ever know!” This bathroom spray treats your toilet water to prevent scents from entering the air. They even come in gift sets, perfect for your favorite IBDer this holiday! 1. Finally, give love and support – The very best thing you can give your IBD friend is your support. Whether emotional, or monetary (or both!) just knowing they have an unconditional friend is worth more than any gift. You can easily make a donation in their name, or show your support by providing an listening ear, unconditional friendship, a gut-friendly homemade meal, or maybe a movie marathon date- somewhere that they can relax and be near the bathroom. But wait, there’s more! Check out these 12 more IBD Gift Ideas, including things for IBD athletes, hospitalized patients, and anyone that needs a laugh, or inspiration, or both!